These cards were such fun cards to make. I made two versions of Reindeer cards, these are for those who might already own the Stampin’ UP! Cookie Cutter Christmas polymer stamp set and/or the Cookie Cutter builder punch. You can buy pre-made base cards and envelopes that are ready to decorate but I chose to cut mine from tan colored card stock. The most popular card size for greeting cards is known as size A2 which measures 4.25″ x 5.5″- this means you can cut two cards from a standard 8.5″ x 11″ piece of cardstock. 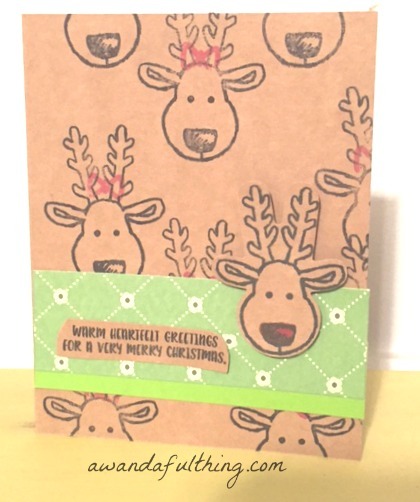 For the first card I decided to use the reindeer stamp and randomly stamp it all over the front of the card. I overlapped two pieces of complimentary but different color card stock close to the bottom of the card and added a cut out reindeer and used dimensionals to add it to the card to make it stand out . Included in the Stampin’ UP! Cookie Cutter Christmas polymer stamp set is a stamp that says ‘warm heartfelt greetings for a very Merry Christmas’ which I stamped on some tan card stock and cut out with scissors and glued it to the card. I started with the same size card base and cut two pieces of card stock, red and white for layering on the front of the card. The red piece was cut at 4″x 5.25″ and the white card stock was cut at 3.75″ x 5″. The three banners are from leftover pieces of paper, cut at different widths. If you don’t own a banner punch you can cut the triangle out with scissors or leave the edges straight. You could even use Washi tape instead of banners for decorating the front of the card. The red scallop piece is from a 2.5″ inch scallophole punch and the white circle is from a 2″ circle punch. All of these layers were adhered with snail glue. I used a punched out stamped reindeer and added a small piece of red glitter paper for his nose, I used more dimensionals to attach it on top of the layered circles. I chose to stamp Merry Christmas on the front of the card but you could leave it blank or stamp whatever greeting you might have (you could hand write a sentiment). Overall these cards were pretty quick and easy to make. 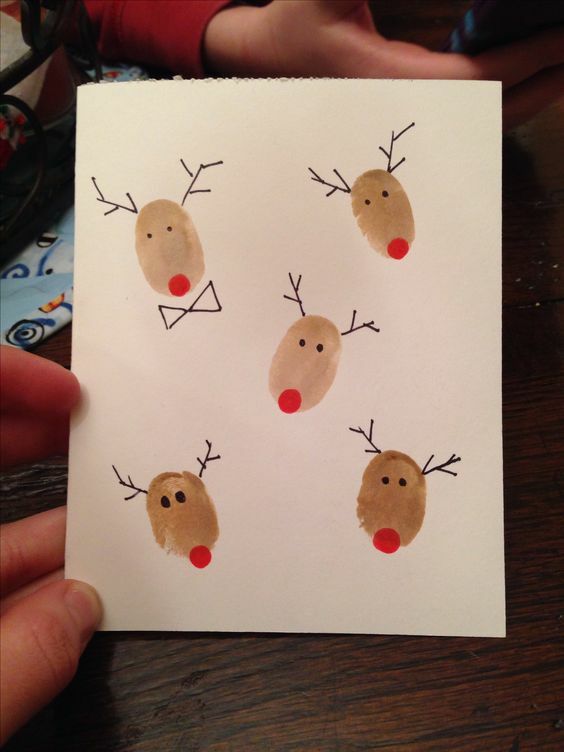 I found another reindeer card that only requires a card base, craft paint and a pen or pencil AND it’s super adorable. I think I just found the Christmas craft I can make with my grandson this year. Here’s the link. 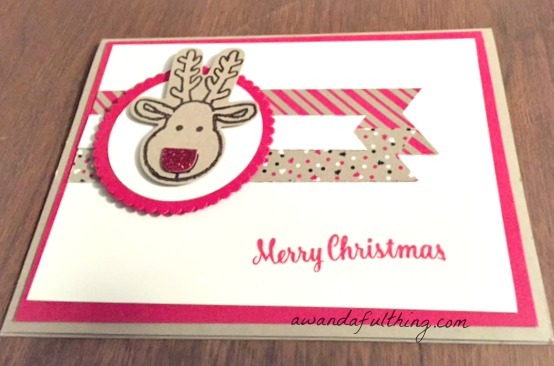 Day 10 –Handmade Reindeer Cards– It’s A Wandaful Thing! This entry was posted in DIY, Make and tagged card, card stock, craft paint, dot, easy, finger print, fun, glue, ink, make, paint, pen, pencil, red, reindeer, Stampin' UP!, stamps, thumb. Bookmark the permalink. I m glad I found your blog!! These are awesome. The cards are sweet. Always looking for new designs. Thanks. Love the cards – too sweet.